The young people of the world did very little to create the global mess that is climate change, yet they’re the ones who will be forced to inherit it. That’s exactly why they’re taking to the streets Saturday. This is Zero Hour, baby. That’s what the youth have dubbed a global movement that’s manifesting in at least 20 marches this weekend. The name Zero Hour is indicative of the urgency around climate change. While the organizers announced the campaign back in March, it’s been in the works for a year now. Co-founder Zanagee Artis, who’s just 18 and is the logistics lead for the march, met co-founder 16-year-old Jamie Margolin last year at a summer program with Junior State of America at Princeton University that focused on developing skills to take part in an effective democracy. They held a meeting on climate justice to see who’d be interested, and the whole thing took off from there. See, although Artis hails from Connecticut, and Margolin lives in Seattle, they’re from the internet generation that thrives off social media. And it’s a big part of what sets their generation apart. 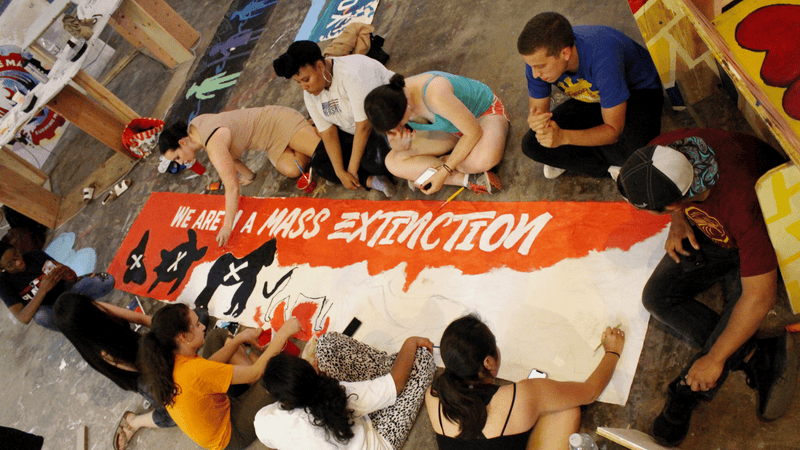 Diversity and race are taking center stage at the Youth Climate March Zero Hour is leading this weekend in Washington, D.C. This means including some of the youngest members of the Standing Rock Sioux Tribe, who protested against the Dakota Access Pipeline in 2016, as speakers, Artis said. It also means featuring people like Martinez, who advocates on behalf of the environment and indigenous people, navigating an identity that’s both Latino and indigenous. It is not the poor people who are to blame for climate change, but it is poor people who are suffering first and most from it. Therefore, we the people must come together to take action to defend each other. The platform goes on to emphasize working with First Nations to protect treaty rights, building affordable (and sustainable) housing, creating affordable public transit systems, and learning from communities in the Global South that are taking steps to prepare for climate change. Young organizers have brought their platform directly to lawmakers in a lead up to Saturday’s march through lobbying efforts that took place Thursday. Organizers with Zero Hour meet with Sen. Bernie Sanders during their lobbying day Thursday. The main Youth Climate March will take D.C. by storm Saturday, but sister marches are scattered throughout the U.S. and world. In Kenya, activists are planting 2,000 trees in solidarity. Celebrities like actors Shailene Woodley and Leonardo DiCaprio have endorsed the event, and organizers are expecting several thousand people to turn out on the National Mall. The youths are also bringing their fight to court. Zero Hour’s platform is based on lawsuits Our Children’s Trust has filed against the federal and state governments throughout the U.S. in an attempt to compel the government to take action on climate change. Margolin and Martinez are both plaintiffs to separate cases. “We’re targeting the federal government because we really want to hold people accountable for what they’ve been saying for so long: that they’ll be doing their best to implement climate policy,” Artis said. As the kids have found out, there’s no time left to wait on the adults. They’ve taken the fight into their own hands. And they’re out here swinging.